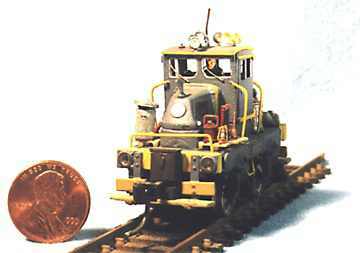 One of my favorite engines include a tiny Mack Truck locomotive made as an unpowered casting from On-Trak Model Products. I installed a Northwest Shortline drive unit, and added numerous details and a constant lighting circuit, with fiber optics leading to both front and rear headlights. 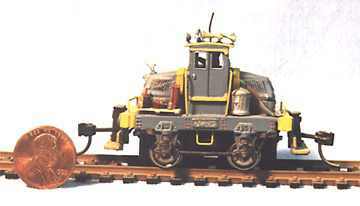 Future plans include making one to run on HOn30 (N-gauge width) track. The disk-shaped copper object is a US penny (7.5 mm diameter).